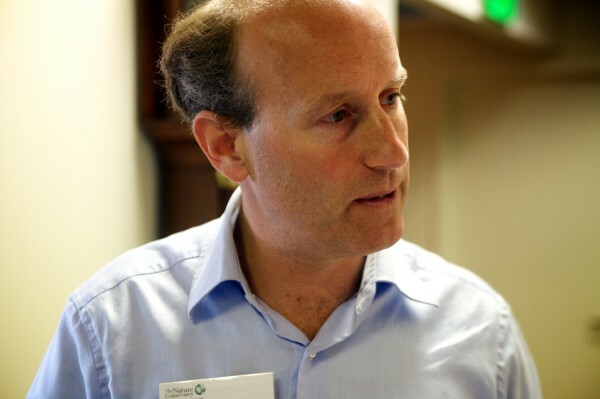 Michael Tetreault, executive director for the Maine chapter of the Nature Conservancy, talks about a new conservation deal protecting lands surrounding Moosehead Lake at a press conference in Portland on Tuesday, May 15, 2012. PORTLAND, Maine — Calling it the “missing piece” to a 2 million-acre jigsaw puzzle, groups on Tuesday announced the completion of a 363,000-acre conservation deal that was key to Plum Creek winning regulatory approval for its controversial Moosehead Lake development plan. Representatives from Plum Creek, The Nature Conservancy and the Forest Society of Maine said the conservation easements — described as the second-largest easement package in U.S. history — will benefit the forestry and tourism industries critical to the Moosehead region’s economy. The easements will continue to allow Plum Creek to harvest timber through logging practices certified through the Sustainable Forestry Initiative while allowing public access for hunting, hiking, snowmobiling and other activities. The land, which Plum Creek will continue to own, also links up with other protected natural areas to create a patchwork of conserved land stretching from northern Aroostook County to Baxter State Park. 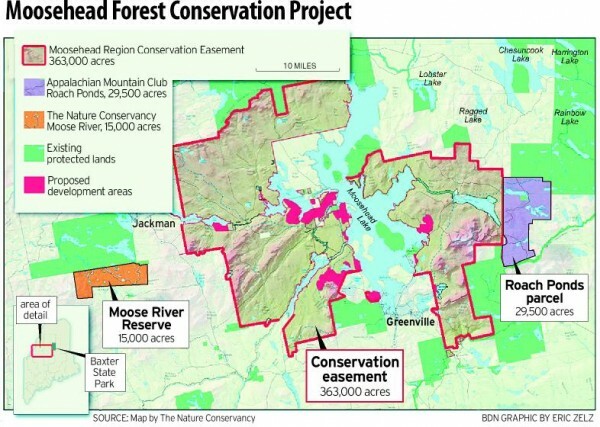 Michael Tetreault, executive director for the Maine branch of the Nature Conservancy, called the newly conserved acreage “the jewel” on a necklace-shaped ring of previously protected forest land in the Moosehead Lake area. Under the terms of the agreement, The Nature Conservancy paid Plum Creek $10 million for part of the 363,000-acre easement, with the company essentially donating the value of the remaining easements as part of the Moosehead Lake “concept plan” approved by state regulators. Those easements will ensure the land will remain a working forest while guaranteeing public access for outdoor recreation. The Forest Society of Maine will hold the easements, as it has done for numerous other forestland conservation deals across the state. Greenville Town Manager Gary Lamb attended the Tuesday press conference, held at the Maine Historical Society in Portland, where maps of the property and old black-and-white logging pictures circled the event room. Lamb touted the Plum Creek plan to concentrate development in small areas — on just 4 percent of the total land within the rezoning plan — while leaving large tracts of land open for recreation and wildlife. Although negotiated privately between the parties, the 363,000-acre conservation deal was an integral component of the Land Use Regulation Commission’s decision to approve the largest development plan in Maine history. That plan gives Plum Creek or any future landowner 30 years to develop 2,025 “dwelling units” near Maine’s largest lake. Those units could be single-family homes, condominiums, townhouses or lodges. The roughly 17,000 acres rezoned for development include two resort areas on Lily Bay near Beaver Cove and on Big Moose Mountain west of Greenville. The debate over Plum Creek’s development plan raged for years and deeply divided Mainers, with some viewing it as wilderness sprawl and others as a healthy mix of planned development and conservation. LURC held hundreds of hours of hearings and heard or reviewed testimony from thousands of citizens during one of the longest and costliest regulatory hearings in state history. But in their September 2009 decision, LURC officials made clear they were only comfortable rezoning land for that much development due to the equally historic conservation agreement negotiated between Plum Creek and three organizations. In addition to the 363,000-acre deal involved in Tuesday’s announcement, the Appalachian Mountain Club and The Nature Conservancy purchased another 41,500 acres from Plum Creek. All told, the conservation package negotiated as part of LURC’s proceedings on the Plum Creek application total more than 400,000 acres. The conservation deals had been largely completed before Tuesday’s announcement but were on hold while critics of LURC’s decision pursued appeals through the courts. The Maine Supreme Court upheld LURC’s decision in March, clearing the way for Plum Creek to proceed with its development plan and finalize the conservation package. Development will not happen overnight, however. Plum Creek must receive permits for each individual subdivision or resort, and the company’s critics have pledged to stay engaged in the process. Plum Creek Senior Land Asset Manager Luke Muzzy said before the Portland press conference his organization’s timetable for developing the land rezoned for houses and resorts is up in the air. He said the housing market and economy, as well as the state permitting process, are all factors Plum Creek will take into consideration. He said the group is currently focused on finalizing the conservation and recreation portions of the plan, which he said provide predictability to Moosehead-area businesses that rely on wilderness space for campers, sportsmen and tourists. One of the vocal critics of Plum Creek’s plan, the organization RESTORE: The North Woods, released a statement after Tuesday’s press conference saying that it continues to have concerns about the effects of second homes “scattered along hillsides and shorelands.” RESTORE said a better option would be the creation of a North Woods national park. The groups behind Tuesday’s announcement, meanwhile, pointed out that easement land includes 200 miles of lakeshore, access to 160 miles of hiking or snowmobiling trails, habitat for the federally protected Canada lynx and 30 sites that provide habitat to rare or endangered plants. BDN staff writers Seth Koenig reported from Portland and Kevin Miller from Ellsworth.